Jerusalem Mayor Nir Barkat is promising to develop Jerusalem for the benefit of younger citizens as well as olim. Jerusalem Mayor Nir Barkat is promising to develop Jerusalem for the benefit of younger citizens as well as olim (new immigrants). 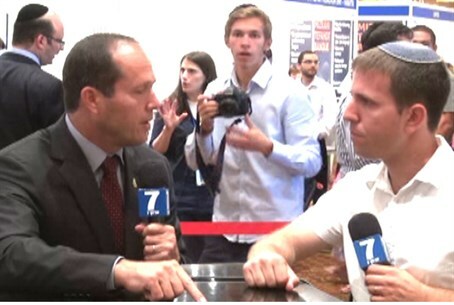 Barkat spoke to Arutz Sheva at a huge aliyah event which took place last week in Jerusalem. “We’re becoming a place for tourists, for residents, for investors, and I’m eager to develop the city for the benefit of olim and of young people,” he said. Barkat, who will seek a second term as mayor in the municipal elections this coming October, said that his plans for the next five years, if he is re-elected, include a dramatic increase in the job market, which olim could easily integrate in, because they are well-versed in languages such as English and French. “For me, the job market is the most important element for olim and young people,” he said. “Along with that, we’re expanding education and other elements of quality of life that are very important for me to improve." Jerusalem, said Mayor Barkat, is one of the safest cities not only in Israel, but in the entire world.